Rebels and Rulers, 1500-1660 is a comparative historical study of revolution in the greatest royal states of Western Europe during the sixteenth and the first half of the seventeenth centuries. Revolution as a general problem and the causes and character of revolution in early modern Europe have been among the most widely discussed and debated topics in history and the social sciences since the 1940s. 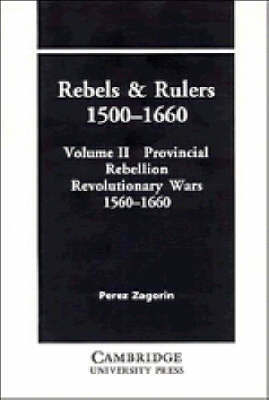 Although the subject of social and political unrest and revolution in the early modern period has received much attention, and despite the existence of a very large literature devoted to particular revolutions of the time, no one has attempted the broad comparative synthesis that is given by Professor Zarogin in this study. Volume II deals first with provincial rebellions in the French, English, and Spanish monarchies. The remaining chapters are devoted to a synoptic account of the French civil war or wars of religion, the Netherlands rebellion, the English revolution, and the Fronde. Rebels and Rulers is a comprehensive discussion of early modern revolution that contains an examination of the most significant revolutions of Western Europe in the period before 1789. It offers fresh understanding of both well-known and neglected revolutionary events and is the first work to consider the many diverse revolutions of this seminal epoch in comparative historical perspective.